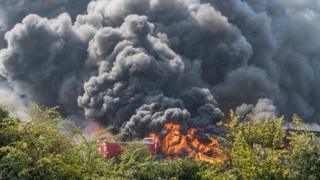 A huge scrapyard fire involving 1,000 tonnes of metal has sent plumes of smoke over the skies of a Nottinghamshire town. The fire in Great North Road, Newark, started shortly before 11:15 BST. Twelve fire engines were at Briggs Metals, with police, the Environment Agency, East Midlands Ambulance Service and Public Health England. The road was closed while firefighters tackled the blaze and there were no reports of any injuries. People living nearby have been told to keep their windows and doors shut and motorists are advised to avoid the area. Mick Sharman, from Nottinghamshire Fire and Rescue Service, said crews had been tackling the fire in "very challenging circumstances". He said six fire engines would remain at the scene throughout the night to continue fighting the fire at Briggs Metals.